I have been asked on many occasions how I produced my present line of silvers. The following will give you some idea about how I went about this. My foundation silvers were two males and a female from Walnut Hill lines. Their names were (1) Razberrilane Magnificent Revue, (2) Razberrilane Clouseau Bumblekins, and Razberrilane Fleur. I bred Clouseau to Fleur once, and the offspring I kept from this breeding were (3) CH Missionhill Whispering Hope and (4) SGC Missionhill Da Vinci. A few years later I purchased a chinchilla male named (5) Deealden Astara of Missionhill. I bred Astara to Whispering Hope and a lovely male chinchilla was born of this union, who was (6) GC Missionhill Picasso of Appleblossom. 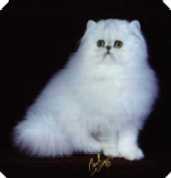 Shortly afterwards I saw a superb black persian female at a show in Vancouver named GC Keeperkit Love is Juliana. She had an extremely sweet face and this is when I first had the urge to reproduce this extreme type in a silver persian. This is how (7) CH Keeperkit Waltzin’ Matilda joined our family. My first breeding of Waltzin’ Matilda was to (1) CH Razberrilane Magnificent Revue. This breeding produced two silver tabby females, Missionhill Petite Cozette and Missionhill Angelina. Cozette was petite and cobby and Angelina was large and heavy boned. My second breeding of Waltzin’ Matilda was to (6) GC Missionhill Picasso of Appleblossom. This breeding produced a heavy boned female with very large green eyes who I registered as a silver tabby, but who later turned out to be a very clear coated shaded silver. Her name is Missionhill Carmen of Sericia. She was placed with a friend and was subsequently bred to a chinchilla silver male named Shadowspurr Star Prophet of Sericia. The two female offspring that were born from this breeding were extremely important cats in my breeding programme, as will be evident from any of my pedigrees. Their names were (8) CH Sericia Arabesque of Missionhill and (9) CH Sericia Camellia of Missionhill. Neither Arabesque nor Camellia had any outstanding qualities. However what made them very important to me was the fact that they had good coat colour, fairly good eye colour and had the capability of producing extreme kittens. Angelina was bred to (5) CH Deealden Astara of Missionhill and produced (10) CH Wee Luvs Magnificent Heritage. Heritage was a large, powerful shaded silver male, clear coated with pale aqua coloured eyes. When I bred Heritage to Camellia, I linebred back to my foundation Razberrilane silvers as well as to Waltzin’ Matilda, my black female. This breeding “clicked” and produced many heavy boned, extreme shaded silvers. About the time that Carmen was born, I purchased a cream CPC named (11) GC Twinshire Gainsborough Masterpiece. A year before purchasing this male, I had seen a photo of his mother, GC NW KJ’s Miss Abits of Twinshire, in a CFA Yearbook, and once again I had the urge to produce this type in a silver. Gainsborough produced kittens with cobby bodies, large heads, full cheeks and heart-melting, tear-drop eyes. (11) Gainsborough’s first silver breeding was to (8) Arabesque. This breeding resulted in two stunning kittens, one of which was a silver patched tabby female. I named her (12) Missionhill Sovereign Dynasty, and she is the little cat who brought it all together for me. Sovereign had a personality like no cat I have ever had and has passed this enchanting personality down through all her offspring. Realizing that I was in need of a male chinchilla to outcross my non-colourbred silvers to, I purchased (13) CH Ultamint Cavalier of Missionhill. This cat had a fairly long nose and large ears; however he had a few very important features that I was looking for: good coat and eye colour, and a solid far back in his pedigree. (13) Cavalier was duly bred to (12) Sovereign and produced many extreme kittens, with very sweet faces, two of which are (14) GC, GP Missionhill The Enchanted Chalice (one show grand premier) and (15) GC Missionhill The Celestine Vision. About the same time that (11) Gainsborough was being bred to (8) Arabesque, I bred (9) Camellia (the sister of Arabesque) to (10) Heritage. Heritage and Camellia produced some outstanding kittens, including (16) GC Missionhill Astral Vision. The cats I had produced up to now were extreme, heavy boned silvers with good coat colour and eye colour, however I wanted to ensure that this “type” was set to produce a certain look that I wanted on a consistent basis. So it was with great excitement and anticipation that I awaited the birth of the first litter of the breeding between (16) GC Missionhill Astral Vision and (15) GC Missionhill The Celestine Vision. The results were even better than I had hoped for. There were 5 kittens born, 4 of which were exceptionally nice. Some of the cats from these breedings are: (17) GC RW Missionhill Fait Accompli, (18) GC Missionhill Tranquille of Coujee, (19) CH Missionhill Kissing Rain of Tharamspride, (20) CH Missionhill Celestial Triumph and (21) CH Missionhill Tufaan of Hapynesis. (8) Arabesque was subsequently sold to a breeder in the eastern United States, and I was fortunate to purchase one of her sons a few years later. This was a very large shaded silver male, (22) CH Ambi Pharo of Missionhill. I have been fortunate in that most of the cats I have purchased as outcrosses have blended really well with my lines. Two of these are (23) CH Fanfair’s Abriel of Missionhill and (24) GC Ver Halen Wisdom Seeker. (23) Abriel bred to (17) Fait Accompli produced (25) Missionhill Grandfinale of Ultamint and (26) Missionhill Coup de Grace. (24) Wisdom Seeker bred to (16) Astral Vision produced (27) GC Missionhill Infinite Wisdom. I firmly believe that in order to get consistent type in silvers it is essential to line breed to your best cats. It is also very important to outcross every few generations. However good looking a cat might be, if the health and temperament are questionable it should be phased out from a breeding programme. These problems can come back to haunt you over the years. I have found it is relatively easy to breed kittens with very short noses. What is more difficult is maintaining the short nose together with correct coat and eye colour. Another problem I have faced over the years is occasionally getting kittens that are born too extreme and this can give rise to future health problems. Kittens that are born with wide set eyes, a fairly short nose and not too deep a break always end up by having a wide open, typically sweet silver expression. Those that are born with ultra short noses and deep breaks usually end up with a closed expression and have a problem breathing when they are fully grown. There are now quite a few breeders around the world who have been breeding solids into their silver lines . A few years ago this was frowned on by the majority of silver breeders. It was feared, and quite rightly so, that those qualities that are so unique to the silver persian would be lost when silvers were outcrossed to solid persians. I have no doubt that introducing tabbies into silver lines can create problems with barring and this can take several generations to eradicate. However, I have not found this to be a problem when using solid persians. I have also found that the personalities of my non-colourbred silvers to be better in many ways than my colourbred silvers. I hope this article will help those silver breeders who may want to try outcrossing for a unique look of their own.